Remember those old music videos of the early 50’s? From the first ever motion images demonstration to today’s social media marketing content, video format has always left the masses amused. After the evolution of the internet, video has found varied reasons for its existence apart from mere entertainment. According to the State of Inbound report 2017 released by HubSpot, video marketing is a growing priority for most marketers across the globe. Videos are not only found on YouTube and social media platforms anymore but, have also expanded to website landing pages and emails. With online video makers/editors, the concept of video creation is now open for all irrespective of their lack of professional expertise. One of the most effective ways that help ease the video creation process without loss of quality is stock footages. 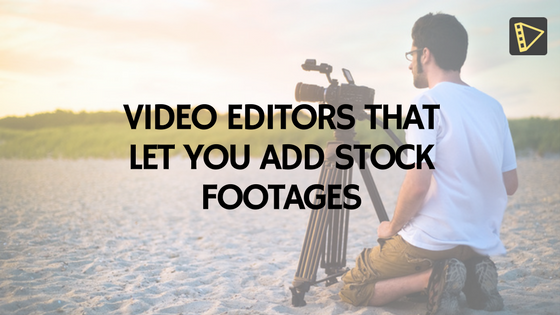 Apart from online stock footage sites, saving your time, money, and offering a better user experience are video editors/makers who also give access to stock footage resources. Did you know that even Hollywood uses stock footages? Now let’s look at the video editors that let you add stock footages. Magisto is known mainly for their Artificial Intelligence technology that interprets unedited videos and identifies the most interesting parts. They’ve lately introduced ‘Magisto for Marketers’ that intends to make video marketing for Small Businesses (SMB’s) an easier task. The tool incorporates custom style fonts and colours for better branding. The users get access to over 100,000 stock footage to choose from easing the video creation experience. The tool has both, monthly and annual plans to choose from. Though the stock footage is available only with the ‘Business’ plan. The monthly plan offers for ‘Business’ is for $79 per month while the annual plan is for $39 per month. You can have a better look at their pricing plans here. Moovly is a cloud-based content creation tool that was launched in the year 2012. With Moovly, a user can get access to more than 500,000 of stock footages. Moovly has two variations in monthly plans – the Professional plan is priced at US$ 24.92 and the Enterprise plan is priced at US$125. The tool offers special pricing plans for users with educational purposes. On Animatron Wave, you get to choose from 2.5 million stock library. Once the video is uploaded or chosen, the user can add captions and apply text effects too. You can choose to stick to stock footages or your own media or a combination of the both to create videos online. Apart from the 2.5 million stock video library, also explore their royalty-free audio library with over 300,000 audio files to choose from. You can have a better understanding of their pricing plans here. Promo is a video making platform that comes out of Slidely, an image-based social network and video creation service. The tool helps users create videos with the help of stock footage. Promo’s collection of stock footages exceeds 2 million. Choose the most desired footage that suits your purpose, add appropriate caption and music and, voila, your video is ready to go. Promo has 4 different pricing options that one could choose based on their video making plans. You could check out their pricing plans here. Now as we’ve told you about the tools you could use, when are you planning to start? We will keep adding to this list as and when we find more tools that could help you achieve your video making goals.